The Exo Terra Crested Gecko Habitat Kit is the ideal setup for the beginning reptile hobbyist. The kit comes with all the components necessary to give your terrarium hobby a successful start! The Exo Terra Crested Gecko Habitat Kit is the ideal setup for the beginning reptile hobbyist. The kit comes with all the components necessary to give your terrarium hobby a successful start! 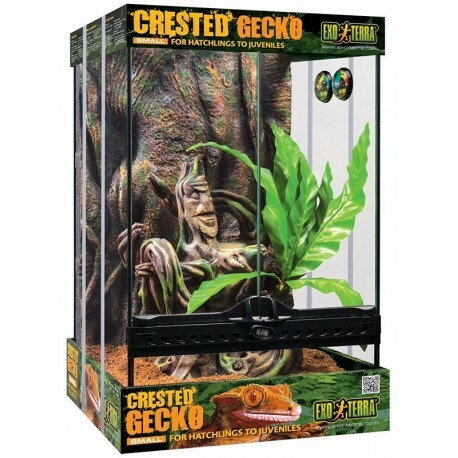 The Exo Terra Natural Terrarium features front opening doors, allowing easy access for maintenance and feeding and a unique double ventilation system with full screen top. All components of the Crested Gecko Habitat Kit are based on the knowledge gathered during the New Caledonia Expedition in combination with information on captive husbandry from well-known gecko breeders. The background included in the kit is a copy of a tree trunk overgrown with lianas and littered with lichens and mosses that we found during the expedition to New Caledonia. The uniqueTotem ornament reflects the spirit of the indigenous Kanak people's culture, their sacred totem statues are found all over the Islands. The Kanak Totem Ornament also serves as hiding cave, water bowl and food cup holder.